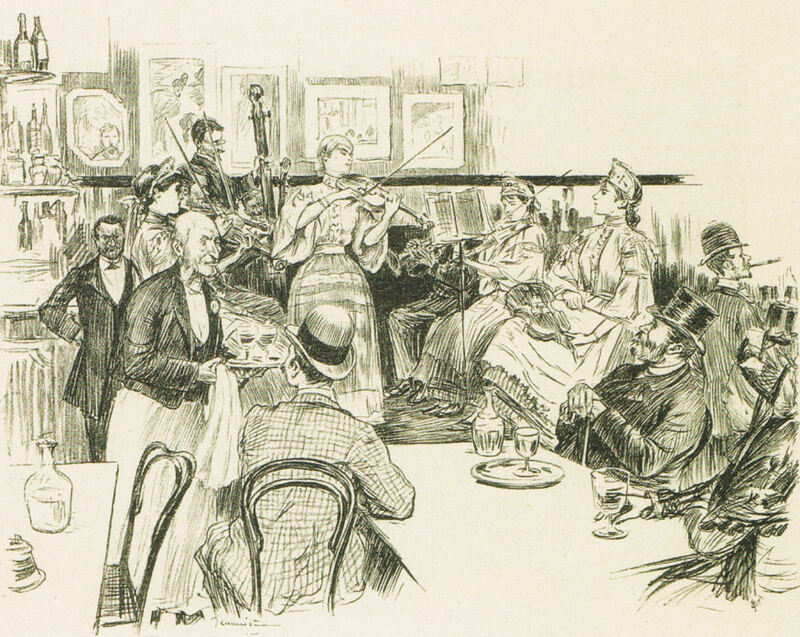 If you find yourself among the gentlemen in their frock coats and wide cravats in a Parisian café in the 1880s during the hours just before dinner, and are wondering what to order, the word you’re looking for is vermouth. Between the hours of 5 and 7 all the best people crowded these fashionable watering holes for a pre-dinner tonic to whet the appetite. The most popular was vermouth, served plain over ice, or mixed with something sweet like curaçao, cassis or gomme, a simple syrup made with water, a very high percentage of sugar, and gum arabic to prevent the sugar from crystalizing. How did vermouth fall from being the being the apertif of the beautiful people to a thing they now brag about avoiding? 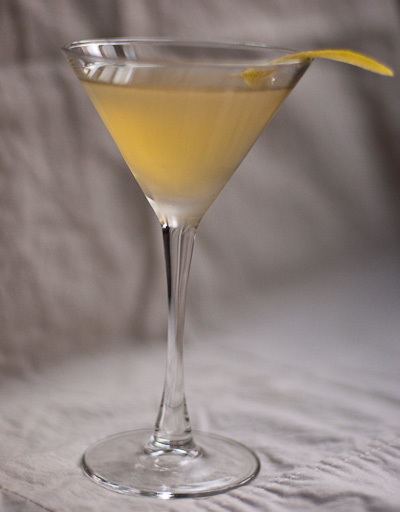 The first mention in print of the Vermouth Cocktail is in 1869 where it is defined as chilled vermouth with a dash each of bitters and maraschino liqueur, and a twist of lemon. Apart from Prohibition, during which it was difficult to get, vermouth was used in many cocktails until the mid-20th Century when the fad of the “dry martini” began. This was accompanied by much silliness about how much (or really how little) vermouth to add, including games like waving the bottle over your glass, or having a friend leave the room during the mixing and then return to whisper the word “vermouth” just before taking the first sip. Martinis are not meant to be that dry. In this stupendous article on the subject, Jason Wilson speaks with cocktail expert Robert Hess who points out that “those mid-20th Century luminaries who championed a nearly vermouth-free martini, such as Ernest Hemingway, Winston Churchill and Humphrey Bogart, were borderline, if not full-blown alcoholics.” If you want a glass of gin, order one, but if you want a martini, Wilson encourages the restoration of a pre-war version which contains at least 4 parts vermouth to one part gin, or a pre-Prohibition recipe that is 50-50 gin and vermouth. Yuck, you say? Ah well, perhaps that is because it is likely the only vermouth you have tasted has been of low quality to begin with and then has oxidized because it’s been open too long and stored improperly. Vermouth is white wine that has been infused with a mixture of botanicals and fortified by the addition of a neutral alcohol like un-aged brandy or grain alcohol. The fact that it is fortified leads many people to believe that it is shelf-stable, that is simply not true. For a better vermouth experience, buy a high quality product such as one of the offerings from Boissiere, Noilly Prat, or Vya, and always buy from a source with high turnover. Vermouth should be used within 6-8 months of bottling or it begins to go off. Once opened, it should be stored in the refrigerator and away from light. Even when stored properly, it oxidizes like any other wine, so it is advisable to finish the bottle within a month after opening. Unfortunately, this means you should almost never order vermouth (or a cocktail containing it) in a random bar where the bottle is just sitting out and has been open for who knows how long. Find a cocktail establishment where they care about these things, or make it yourself at home. Its refreshing character makes vermouth a perfect after work tipple accompanied by a handful of salty nuts. Let’s join the beautiful people of 1890s Paris and bring back this delectable treat. Add all ingredients except the twist of lemon to a cocktail shaker, shake with ice and strain into a chilled cocktail glass. Garnish with the twist of lemon and serve in a 3½ ounce glass.